ATHLETES were out in force at The Meadows on Thursday night for the annual Tavistock Relays. More than 100 teams of four took part in the event which has been running for 32 years and forms part of the Tavistock Carnival. Each athlete in a team completes a lap of 1.1 miles. The relays were split into three races – juniors, women’s and men’s/mixed – while there was also a family fun run beforehand. 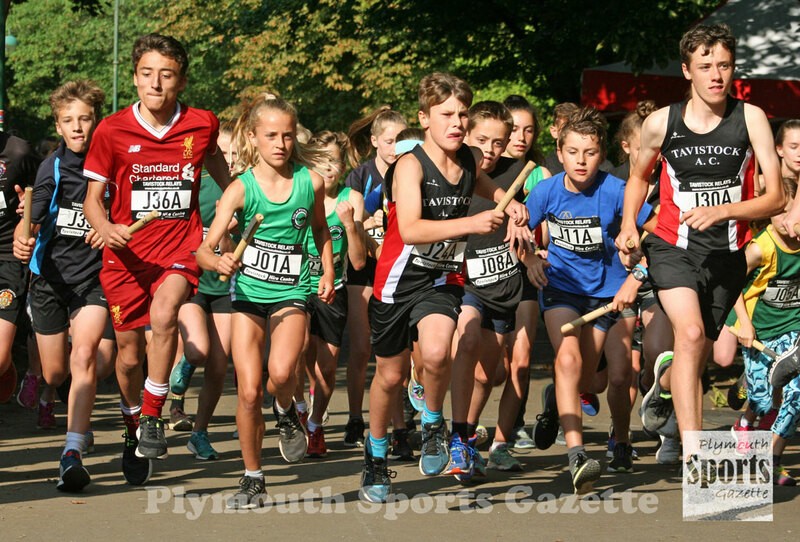 City of Plymouth and host club Tavistock AC were among the big winners on the night. City of Plymouth won the men’s event and the lower age junior sections, while Tavistock enjoyed success in the women’s event and older junior age group. Dean Smith, Jake Hughes, Tom Blackford and Matthew Bradley made up City of Plymouth’s successful men’s team. They finished in an overall time of 20 minutes and 23 seconds. They finished 49 seconds ahead of Tavistock Run Project, who took second place, just three seconds ahead of Tavistock AC. Plymouth Harriers’ quartet of David Beckenkrager, Steve Risdon, Ray Tew and Alex Peyton-Jones won the veterans’ title. City of Plymouth had the top two fastest runners on the night, with Bradley clocking 4:54 minutes and Smith 4.55. Tavistock AC’s Adam Holland was third fastest in 5.00 minutes, with Tavistock Run Project junior Oliver Smart and team-mate Jim Cole next fastest with 5.02. 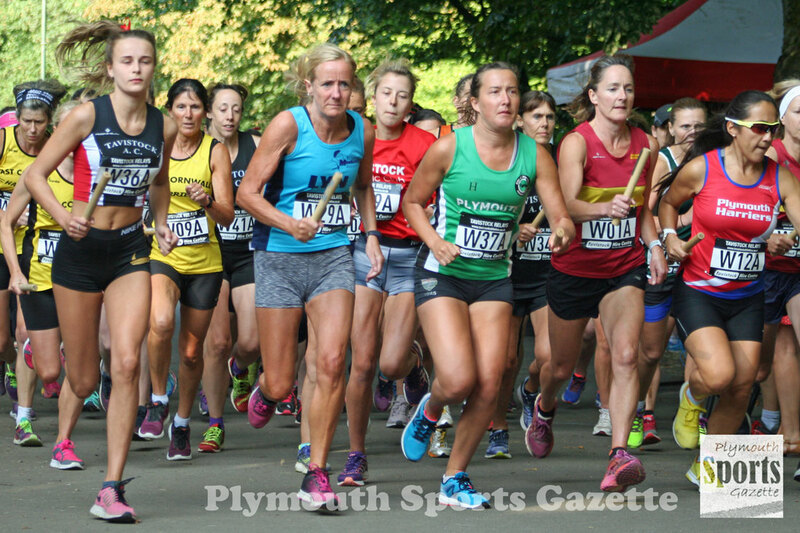 City of Plymouth’s Great Britain international Victoria Weir was fastest female in 5:42 minutes, but her team did not make the medals as Tavistock took the top two places and East Cornwall claimed third. Tavistock’s winning team was made up of Natasha Farrington, Joely Bytheway, Clarissa Nicholls and Emma Ryder. Ryder was second quickest overall in 5.56, with Farrington third with 6.06. Launceston Road Runners won the women’s veterans’ title. Tavistock AC had the fastest junior team with Will Russell, Dan Luckham, Joe Dix and Ollie Woodmason clocking 23.12 minutes between them as they won the Year 9/10 boys’ title. Tavistock AC also won the Year 11/12 girls’ race and the Year 7/8 boys’ title with Ewan Dix, Jacob Holland, Finn Jordan and William White. Tavistock Swim Club Freestyle team took victory in the Year 7/8 girls’ event with Hannah Walker, Olivia Townshend, Charlotte Walker and Emma Luckham. The stand-out performance in the junior event probably came from City of Plymouth’s mixed quartet of Poppy and Rosie Northcott and Barnaby and Jed Hutchings. They clocked 25.50 minutes to not only win the boys’ Year 5/6 title but also finish third overall. Club colleagues Verity Tank, Madeleine Jones, Katie Blair and Holly Reid teamed up to win the Year 5/6 girls’ race. Ollie Woodmason was fastest junior in 5:39, with Poppy Northcott fastest junior girl in 6:13, which was just three seconds quicker than Tank.